Informational resources for opal hobbyists, jewelers or people merely curious about opals. Useful links to other websites in the gemstone, jewelry or opal trade. 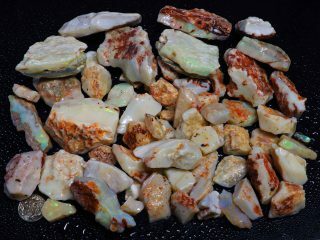 I have personally written several articles on opal cutting, opal carving and opal treatments that I hope others may find useful. Latest information on opal mining in Australia and Ethiopia. Have you ever wondered what a mullock heap is? Or what you are doing when you are noodling for opals? You will find the answer here. The criteria we use to grade our Welo opal for our various opal listings. How the opals we present on our website are photographed.